Apple iPhone 7 comes with fingerprint sensor and 4.7-inch IPS LCD touchscreen display. The device is powered by a 2.34 GHz Quad-core processor along with 2GB of RAM and 32/128/256GB internal space capacity but with no expansion support. It packs 1960 non-removable Li-ion Battery and sports a 12-megapixel rear camera along with 7-megapixel selfie shutter. The Single SIM device runs on the iOS 10.0.1 Operating System. On the connectivity front, it offers 4G, 3G, Bluetooth v4.2, microUSB 2.0, Wi-Fi 802.11 a/b/g/n/ac options. The iPhone 7 comes with a sleek and simple design, which looks similar to its preceder iPhone 6. The main highlight of this smartphone is its new Home button, which will easily draw an instant reaction of people. The Home button no longer moves at all, it is totally solid, just like the trackpad on Macbooks. The handset is also blessed with a sharp, bright and beautiful LCD, which shows a wider range of colours. The screen is so much elegant that you can even tell the difference between the image by an iPhone 7 camera and an iPhone 6s camera. 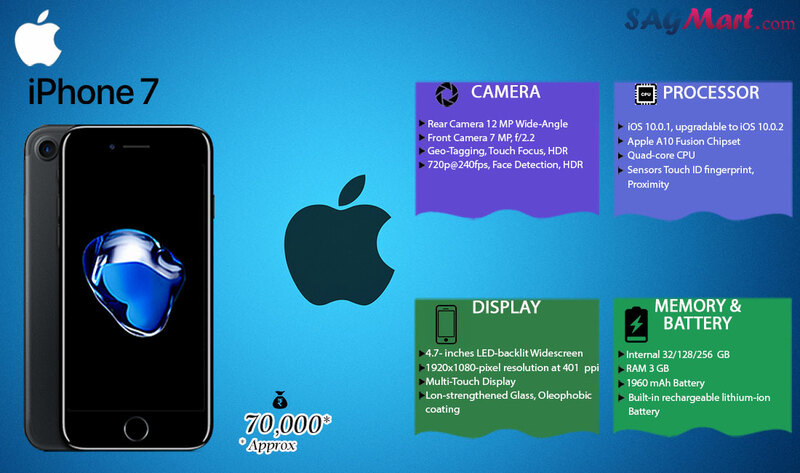 Powered by Apple A10 processor coupled with 2GB RAM, the handset is a fine gadget to go on with. It gives a smooth working experience with a better storage capacity, as the device comes in three variants of 32GB, 64GB and 128GB. iPhone 7 packs a mind blowing camera, which is believed to be one of the best cameras till now. The smartphone is blessed with a 12-megapixel rear camera with a 7-megapixel front shooter, capable of recording HD videos. The camera of iPhone 7 is upgraded with some cool and exciting features like f/1.8 aperture, Optical Image Stabilization, Six-element lens, Body and face detection, Wide colour capture for photos, Live photos and Quad-LED True Tone flash. The Apple iPhone 7 is backed up by a Lithium-ION battery, which is just a bit larger than the batteries of iPhone 6 and iPhone 6s. The battery bart of this model is not satisfactory reported by some users. The overall performance of the model is good but it is a bit expensive, which will make consumers to think twice before going on with it.